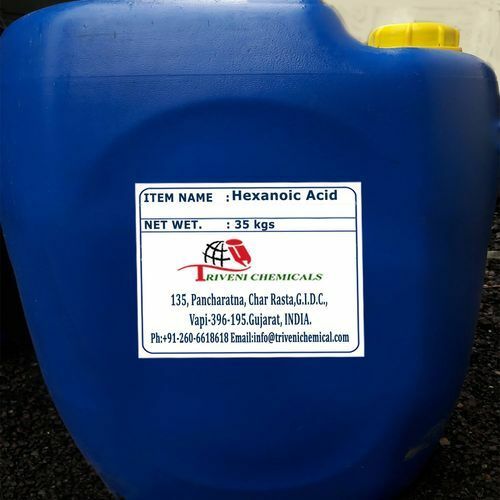 Hexanoic Acid (142-62-1) Oily liquid. It is also known as Caproic Acid. It is also available in multiple packaging. Hexanoic Acid is Oily liquid. • Storage : Keep container dry. Keep in a cool place. Ground all equipment containing material. Corrosive materials should be stored in a separate safety storage cabinet or room. • Solubility: Soluble in methanol, diethyl ether. Partially soluble in cold water. Triveni Chemical is one of the leading suppliers of Hexanoic Acid in India.